• Auditorium “La limonaia” seating for up to 60 people, presidential table with blue table cloth. • Ancient Monastery Library work table for seating 18 people. • Sala del pozzo seating for up to 20 people. • Room with network PC and internet connection. Villa Morghen, a prestigious complex (ex monastery), rich in tradition, is a hotel, a holiday home completely restored and renovated in 2004. The simple and essential style have preserved its charm and original aspect, the friendly and comfortable ambience, the modern comforts, all together create an unique and warm atmosphere. Comfort and tranquility when desiring a vacation dedicated to art and culture or for those who want to enjoy a relaxing holiday in the Fiorentine hills. Most of the rooms are very large, much beyond the standard, very bright and some of them have an exclusive view of Florence. 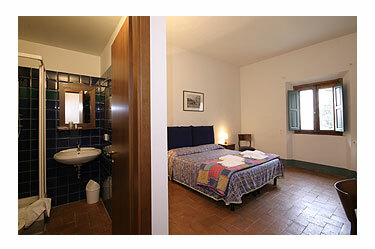 The maximum capacity is for 60 people in rooms with private baths, direct line telephones and television. • Frescoed restaurant in the antique refectory. • Reading room in the old monastery library with many books and periodicals. • TV room with satellite TV for moments of relax. • Wooden choir room used for special cultural events. • Free private parking for up to 15 vehicles. • Information on museums, monuments, public transportation and events in the city, tourist and nature guide books and other information on restaurants and typical products. • Trekking – Settignano is the place from which many trails begin for walks into the Fiorentine hills.